CeraVe products can be purchased at most major drug chain stores, including Mannings and Watsons, and selected dispensing clinics. Yes, CeraVe samples can be redeemed upon registering your email here and liking us on Facebook. Latest information about CeraVe products and promotions will be available on Facebook. Yes, Please be sure to "LIKE" us on Facebook to learn about the latest CeraVe products and promotions. 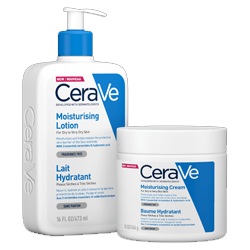 Yes, select CeraVe products are available in various sizes, including convenient travel sizes of 3 ounces or less. 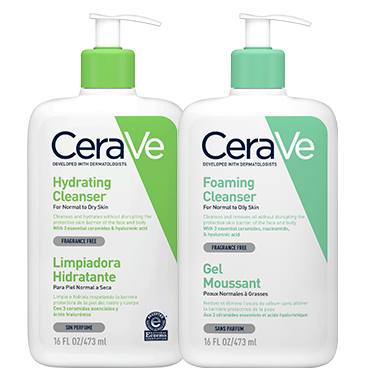 CeraVe Hydrating Cleanser, CeraVe Foaming Cleanser, and CeraVe Moisturizing Lotion are all sold in a 8 fl oz. bottle (also available in larger sizes). CeraVe Moisturizing Cream is available in a 6 oz. tube (also available in larger sizes). "Fragrance-free" means that a product contains absolutely no fragrance. Most dermatologists recommend fragrance-free products, since fragrances can cause irritation for sensitive skin. A product labeled “unscented” may still contain subtle masking fragrances. The patented Multivesicular Emulsion (MVE) technology used in CeraVe products releases key ingredients slowly over time, allowing them to absorb into the skin to hydrate and nourish, as well as help repair, restore and maintain the skin’s natural barrier. This means that CeraVe products keep working to help restore and maintain the natural protective function of the skin barrier all-day long after you apply them. Developed with the expertise of dermatologists, CeraVe has won more seals of approval from the National Eczema Association (NEA) than any other brand. Talk with your dermatologist to learn which CeraVe products are best for your skincare needs. For doctors who would like to order samples for patients’ trial, please fax your request (with the address of clinics, phone number, and email) to 2637 5816 or send an email to [email protected]. We will get back to you as soon as possible.